With the furor over Confederate statues, the parading of swastikas on the streets of Charlottesville and controversial statements about neo-Nazis from President Trump, extremist groups with racist ideologies have come under the microscope. What’s there isn’t pretty, especially in terms of religion. While the vast majority of religious groups, denominations and leaders have denounced race-based supremacists – white nationalists, neo-Nazis, Klansmen and the like – many such groups and their leaders have roots in religion — Christianity, Islam and Judaism. And the link isn’t limited to white groups; there are racially-oriented supremacist, nationalist and separatist groups of African-Americans, Muslims and others. This edition of ReligionLink looks at the religious ideology that motivates some racial extremist organizations. Read “A Source of Light With a Dark Past” by Sharon Otterman for the New York Times, Sept. 17, 2017. The takeaway — a New Jersey church called Zarephath Christian Church is moving away from its foundation by an early 20th century white supremacist. 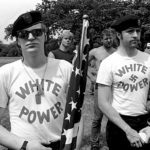 Read “‘Blood and Faith’: A new book links white nationalists to Christianity” by Kimberly Winston for Religion News Service. The takeaway: Damon T. Berry says he thinks white nationalists are now putting their religious differences aside to focus on their shared goal — a white America. View a map and graphs exploring hate groups in the U.S., including those with religious ties, drawn from the Southern Poverty Law Center’s data and published by CNN on Aug. 18, 2017. The takeaway: The map has drawn fire from some conservative religious groups that found themselves listed on it. Read “White Supremacy and Orthodox Christianity: A Dangerous Connection Rears its Head in Charlottesville” by Katherine Kelaidis for Religion Dispatches, Aug. 18, 2017. The takeaway: White supremacists are forming links with Orthodox Christian clerics and churches in Eastern Europe and they were present in Charlottesville. Read “The striking similarities between the KKK and Islamist jihadis” by Jim Sciutto for CNN, Aug. 17, 2017. The takeaway: Sciutto, who spent two years reporting on jihadis, says both groups nod to religion but are motivated more by a sense of victimization. Read “Why the Charlottesville Marchers Were Obsessed with Jews” by Emma Green for The Atlantic, Aug. 15, 2017. The takeaway: The anti-Semitism expressed at the Charlottesville rally may be more virulent than previous forms in the U.S.
Read “LDS Church rebukes Mormon white supremacists, who rebuke the church right back” by Jana Riess for Religion News Service, Aug. 15, 2017. The takeaway: White supremacists within the Church of Jesus Christ of Latter-day Saints feel emboldened despite the church’s teachings that racism is a sin. Read “Were many journalists right when they blamed ‘white Christians’ for Charlottesville riots?” by Julia Duin for GetReligion.org. The takeaway: Are journalists and others expecting more response/condemnation from Christians than they do of other religious groups when their adherents commit violence or acts of racism? Read “What is ‘white supremacy’? A brief history of a term, and a movement, that continues to haunt America” by Anis Shivani for Salon, April 23, 2017. Shivani followed this with “Understanding contemporary white supremacy, part 2: How do we deal with this new form of an old phenomenon?,” a panel discussion, on June 18, 2017. Read “‘My Name is Legion’: Sources and Forces of White Supremacy in the U.S.” by R. Drew Smith for Religion Dispatches, July 8, 2015. The takeaway: A historical overview of white supremacy and its religious ties. The Anti-Defamation League combats anti-Semitism, extremism and terrorism and monitors the activities of extremist and hate groups in the U.S. The Institute for Research and Education on Human Rights monitors extremism, including white nationalism, neo-Nazism and anti-religious bias both in the U.S. and internationally. It maintains a page of analysis of events that involve such groups. The Southern Poverty Law Center is a watchdog organization that monitors hate groups, including white supremacists. It maintains a list of hate groups, including religion-oriented ones. Its current list contains 917 groups but has drawn criticism for including some advocacy organizations that are considered mainstream by many people. According to the Southern Poverty Law Center, these organizations are among those that express religious reasons behind their separatist, racist or supremacist ideology. Note: Where possible, the links below go to the group’s website. Some groups have seen their sites removed by internet hosts because of racist content. In those instances, the link goes to the SPLC’s description of the group. The quotes come from the group’s website or from the Southern Poverty Law Center’s documents on the group. Christian American Ministries – This groups has the identical language regarding religion on its website as America’s Promise Ministries. Covenant People’s Ministry – The church’s forums section is frequently used to air racist, nationalist and supremacist views. Israelite Church of God in Jesus Christ – This black supremacist group claims people of color are the “true” children of God; its leaders have preached anti-Semitism. Nation of Islam – Founder Louis Farrakhan has made numerous statements defaming Jews and white people. Michael Barkun is a professor emeritus of political science at the Maxwell School at Syracuse University in Syracuse, N.Y. He is the author of A Culture of Conspiracy: Apocalyptic Visions in Contemporary America and Religion and the Racist Right: The Origins of the Christian Identity Movement. Barkun participated in a Salon.com panel discussion on dealing with contemporary forms of white supremacy. Damon T. Berry is an assistant professor of religious studies at St. Lawrence University in Canton, N.Y. He is the author of Blood and Faith: Christianity in American White Nationalism. Kaplan participated in a Salon.com panel discussion on contemporary white supremacist groups in the U.S. just before the Charlottesville rally. Michael participated in a Salon.com panel discussion on contemporary white supremacy months before the Charlottesville rally. David Nirenberg is a professor of history at the University of Chicago, where he specializes in medieval Christians, Jews and Muslims. Much of his work has focused on anti-Semitism. Nirenberg told The Atlantic Charlottesville made him reassess the danger of contemporary anti-Semitism, which he had thought was less virulent than older expressions. Ed Stetzer holds the Billy Graham Chair of Church, Mission and Evangelism at Wheaton College and serves as executive director of the Billy Graham Center for Evangelism. He was formerly the executive director of LifeWay Research, a division of LifeWay Christian Resources of the Southern Baptist Convention, one of the world’s largest suppliers of Christian products and services. Through LifeWay, he conducted research on American evangelicals. He is also an expert on church planting and blogs on a variety of subjects about American evangelicalism for Christianity Today. Leonard Zeskind is president of the Institute for Research and Education on Human Rights. He is the author of Blood and Politics: The History of the White Nationalist Movement from the Margins to the Mainstream, in which he explores white nationalism’s relationship to religion. He lives in Kansas City, Mo.